The Medelita White Coat Collection is well-known as the best in class for medical professionals seeking a tailored, fitted lab coat. They have numerous designs in gender-specific styles, ensuring that there is a style for everyone. But the price tag is steep – compare their H.W. Cushing lab coat, which costs $154, to a cheaper Landau lab coat at $30.58. Why is the Medelita lab coat so much more expensive? The simple answer is, you get what you pay for. Quality starts with the raw materials, and the cost of the high-quality raw materials sourced by Medelita for their fabric and buttons actually costs more than the retail price of that Landau coat. The difference in the quality of the fabric is the first thing you’ll notice that makes the Medelita version worth the extra money. You also need to take into account the fact that Medelita lab coats are designed more or less like blazers or nice suit jackets. If you made them about half a foot shorter and in a khaki color or dark neutral, you would basically have something similar to a Brooks Brothers jacket, which is $648. So when you think about it, it’s actually a pretty darn good deal. This entry was posted in Contemporary Lab Coats, Lab Coats, Trends In Medical Apparel and tagged Design Details, designer lab coats, lab coats, Performance Fabrics, quality lab coats on October 26, 2016 by Ariel Jacoby. Looking at these two lab coats, it’s hard to decide which hemline I like better. These defining features are one of the things that make it worth it to spend a little extra on a designer lab coat, and it’s even better that there now exist many styles of lab coats for women so that you really can decide on a lab coat that better suits your personal style. As you can see, the Callia lab coat is infused with feminine elements – check out the slight curve in the hemline and the beautiful rounded collar. Simple, elegant, and flattering – but still professional! The Vera G. has a modern style and is still professional. 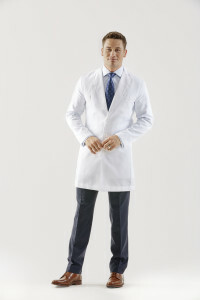 I’m also a big fan of the Vera G. lab coat, which is crisp and polished with straight lines and a modern cut. It’s equally flattering and stylish as the Callia, but with a slightly edgier look. I give up – it’s impossible to decide which one I like better! At the end of the day, your choice of lab coat style should be one that reflects your own personal and professional style. Luckily, there are a lot of options for you to choose from as a woman in medicine. This entry was posted in Contemporary Lab Coats, Lab Coats, Physician Coats, Women's Lab Coats and tagged Design Details, Lab Coats For Women on September 16, 2016 by Ariel Jacoby. There are many lab coats today for women in medicine – a big change from the scant options available 8 years ago. 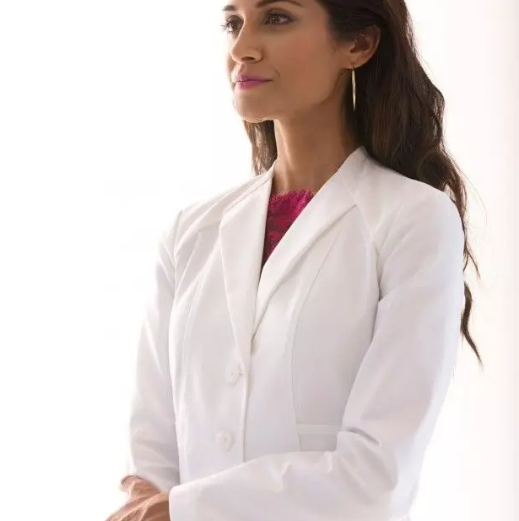 It’s great for female healthcare professionals to have the option to choose a professional white lab coat that is figure-flattering and shows off your personal style. There are classic options for women in medicine who prefer the more traditional look of a lab coat – no frills, just a high quality professional white coat, but for women. 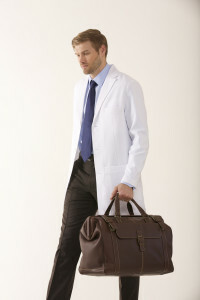 However I personally prefer a more modern style: the Vera G. lab coat from Medelita. Named for the first female surgeon in Russia, Vera Gedroiz, the Vera G. lab coat is exceptionally flattering for women with a lean, athletic figure. It is a slim-cut lab coat; the slim fit is great because it skims over your body without being clingy, tight, or uncomfortable. It’s just incredibly flattering and gives you more confidence while making your rounds, consulting with patients, or even just interacting with your colleagues at an event or medical conference. What I love most about the Vera G. is the sleek construction. It features a beautiful envelope collar, a super professional and modern looking detail which I’ve hardly found on a blazer or suit jacket, much less a medical lab coat. This entry was posted in Contemporary Lab Coats, Lab Coats, Medical Professionals, Physician Coats, Women's Lab Coats and tagged lab coats, Lab Coats For Women, Professional Appearance on August 29, 2016 by Ariel Jacoby. Many doctors and medical professionals these days are turning their backs to the standard-issue one-size-fits-all unisex lab coats of the past, instead opting for styled, tailored, high quality white coats that speak to their high levels of professionalism. Choosing a lab coat that fits you well and looks sharp and polished is always a good move for a physician who is upgrading their professional appearance. Because like it or not, the way you visually present yourself to the world does matter. It doesn’t make you vain or frivolous, it makes you smart. Studies have shown that patients definitely do notice what their physicians wear, and doctors who wear professional-looking white lab coats frequently cite higher patient satisfaction scores. A high quality lab coat starts with the raw materials. If the fabric used to make it is poor quality, chances are the construction of the coat will be as well, and it is likely that the lab coat won’t make it past a few washes in the laundry before falling apart at the seams. Look for performance fabrics that breathe and repel stains, with a bright white finish. This is probably common sense, but a unisex lab coat is not going to look good on anyone. The brand of fitted lab coat that you find should have separate styles available for men and women, because there are definite differences in proportion and design between the two sexes. The more styles there are available for either gender, the better, because you can bet that a lab coat company with many different styles is putting a heck of a lot of thought into every new style they introduce. Small, medium, and large might suffice for scrubs sizes, but if you can, try to find a brand of lab coats that offers blazer-style sizing. If you want your fitted lab coat to fit like a nice suit or jacket, you need this level of detail to sizes so that you look as professional as possible. Slim Fit or Classic Fit? This depends on your personal style. A company that offers these options is going to be paying a lot of attention to how their designs fit the wearer, so you can’t go wrong either way if you’re looking for a fitted lab coat. Generally, slim fit tends to be more contemporary looking while classic fit is a bit more traditional and not quite as close fitting to the body. This entry was posted in Contemporary Lab Coats, Lab Coats, Trends In Medical Apparel and tagged Fitted Lab Coats, Tips and Advice on August 23, 2016 by Ariel Jacoby. If you’ve tried on a Medelita lab coat, the first thing you probably noticed was the fabric, followed by the exemplary fit. Compared to these designer lab coats, the standard-issue cheap white coat feels practically like a preschool smock – you know, the ones they give to students before a messy finger painting session! Why is the fit of these coats so remarkably different? Of course, there is a massive amount of time and care that goes into the design of every coat, but what makes these lab coats fit like a blazer or suit jacket rather than a typical lab coat is the fine construction – specifically the curved seams that allow proper fit and full range of movement. This is just one of the many ways you can tell if your white lab coat is high quality. As any home seamstress can tell you, sewing straight seams is a piece of cake compared to sewing curved seams. Though the effort is well worth it when you reveal the finished product, creating a coat that fits well involves a lot of these curved seams, and that can be a painstakingly slow process. The typical standard-issue lab coats that you’re probably used to are crafted with all straight seams. That’s why these frumpy white lab coats are so boxy and shapeless – they’re designed to fit a cardboard cutout, not an actual human who moves around while wearing their lab coat. The human body has curves, which is why Medelita deliberately takes the time and effort to design patterns that incorporate appropriately curved seams in the arms, shoulders, neck, and waistline of their lab coats. It takes time and effort to build the perfect lab coat, but most of the clinicians who have tried a designer lab coat now feel they can never go back to the straight-seam standard. This entry was posted in Contemporary Lab Coats, Lab Coats, Physician Coats, Women's Lab Coats and tagged designer lab coats, Lab Coat Construction on August 15, 2016 by Ariel Jacoby. Lab coats that actually exude professional style are all the rage right now in the workplace, as physicians and other medical professionals are catching on to the idea that they don’t need to accept the baggy, poor quality coats of the past as their only option. Here’s our top reasons why you should take the plunge and ditch your shoddy old lab coat for a high-performance one that actually fits and makes you look like a professional, rather than someone who is dressing up as a doctor for Halloween. Well, we just said it…a slim fitted lab coat makes you look professional, instead of like a Halloween dressed up costume. Slim fitted lab coats are tailor made to actually fit like a blazer or nice suit jacket. In many cases, slim fitted lab coats are actually designed ergonomically – which means that you still have a full range of movement in raising your arms or moving about freely in general. If a lab coat is slim fitted, it’s probably high quality – meaning it is likely to last longer and have small design details that make all the difference in durability and professional style. Slim fitted lab coats have sleeves that are easier to fold up your wrist. Because of the modern, European inspired design, slim fitted lab coats are made to fit and flatter any body type – from curvy or petite, to broad shouldered or narrow build. Without sacrificing functionality, slim fit lab coats usually still have convenient roomy pockets – they’re just more discreetly designed instead of gaping open. There are many options of lapels and styles for slim fit lab coats, based on your body type and personal preference or style. Slim fit lab coats give you a more professional look, which subconsciously conveys a sense of skillfulness and inspires more trust and respect from your patients and peers. It’s been proven that people perform better in general when they are confident in their appearance and feel more poised – just think back to a time when you had to give a public presentation while you were having a bad hair day, and you’ll know this to be true. High quality lab coats are distinguished by a professional appearance. This entry was posted in Contemporary Lab Coats, Lab Coats, Trends In Medical Apparel and tagged Lab Coat Style, Slim Fit Lab Coats on July 28, 2016 by Ariel Jacoby. Say good-bye to frumpy, boxy, unisex lab coats made of 1-ply polyester. You’ve worked too hard, for too many years, to accept the subpar quality and fit of medical uniforms. Businesswomen get to wear fitted skirt suits or pants suits to work, yet medical professionals are forced to wear what is essentially, a glorified smock. Instead, choose a lab coat that emphasizes your feminine shape. The Emma W. lab coat from Medelita was designed specifically for women working in the medical field. It features a shawl collar, which is very unique for a woman’s lab coat, but the best feature if the back belt that creates a graceful silhouette. The back belt on this lab coat is a visually pleasing detail that draws the eye to the waist, which is the narrowest part of your body. The back belt creates a graceful hourglass shape. You might be thinking that an hourglass shape is not professional for the workplace, but in this case it is. The belt on this lab coat isn’t flashy or tacky or tasteless – it’s very refined, and the shaping is subtle, but oh-so-elegant. This is simply a lab coat that fits you well, because it was made to flow beautifully over the curves of real women, out there working every day, and give you the ability to do that work with confidence. This entry was posted in Contemporary Lab Coats, Lab Coats, Physician Coats, Women's Lab Coats and tagged Design Details, Lab Coats For Women on June 23, 2016 by Ariel Jacoby. Latest in lab coat design. Contemporary Lab Coats. What is the true cost of a tailored lab coat? We asked physicians who regularly order fitted, custom-made lab coats and the majority paid over $500 before shipping it off to an embroidery studio for expensive custom work. Sure, you could pay 30 bucks for a flimsy, one-size-fits-all lab coat, but is that the only alternative? No. There’s hope. One company is doing something different, building incredibly fitted, contemporary women’s lab coats and modern men’s lab coats for under $150 (which includes custom embroidery and free shipping). We think it’s amazing value, especially given the options out there. Do you agree? Let us know! This entry was posted in Contemporary Lab Coats on January 24, 2014 by medelita.